There’s nothing quite like cozying up to the warmth and glow of a crackling fire on a chilly night. 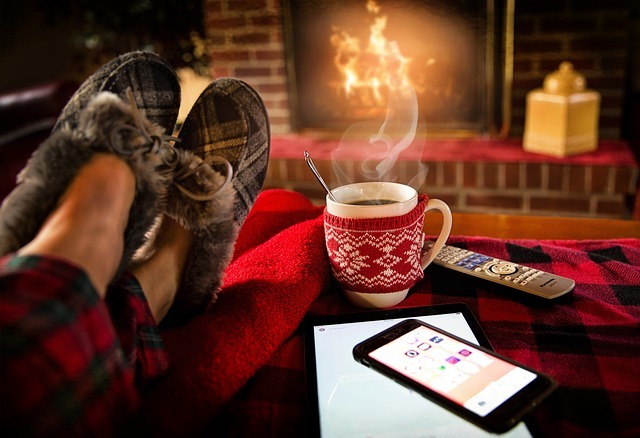 Whether you use the fireplace occasionally or it’s a regular source of heat for your home, it’s important to be diligent about annual chimney inspection and maintenance by a certified chimney sweep. The major culprit of a chimney fire is creosote, a black sticky and highly flammable substance that accumulates inside the chimney. If there is a significant build-up of creosote and the temperature in the flue is high enough, this could result in a fire. In addition to yearly maintenance, there are precautions you’ll want to take to keep your family safe around the fireplace and from a possible chimney fire or worse…a house fire. Clear the area around the fireplace by keeping anything flammable like carpets, pet beds, magazines, decorations, and any debris a safe distance away from the area. Open the damper all the way before starting a fire and leave it open until all embers are finished burning so smoke does not back up into the house. Start the fire by using newspaper and dry kindling, adding bigger logs as the fire grows and keep the fire manageable. A roaring blaze that becomes too hot can crack the flue and damage the chimney making it unsafe. Use only dry well-seasoned hardwood. Wet wood and a fire that burns at too low of a temperature increase the amount of creosote build-up. Never use charcoal or an accelerant such as lighter fluid or gasoline to start a fire. Charcoal releases carbon-monoxide and is not safe to use indoors. Fuels release toxic fumes and can cause a fire to quickly get out of control. Do not burn trash in the fireplace. Plastic, Styrofoam, and wrapping paper are among items that can spark or emit unhealthy chemicals into the air. Use a protective mesh screen to keep stray embers contained inside the fireplace. Never leave the fire unattended and fully extinguish it before leaving home or going to bed. Allow the ashes to cool completely before shoveling them into a metal bucket and taking the bucket outside to a safe distance from your home or any flammable debris. Last but not least, make sure your carbon monoxide and smoke detectors are in working order and have fire extinguishers handy at all times. If you want to enjoy the warmth of your fireplace without worry, don’t allow it to become a hazard. The team at Purity Cleaning and Restoration Services knows first-hand how devastating a house fire and smoke damage can be for a homeowner and family. The restoration process takes time and patience and can displace a family for weeks, even months. By practicing fireplace safety, you will have peace of mind knowing you are protecting your loved ones. Purity is here to help should you need fire or smoke restoration services. Call us at 406-642-3545 or visit us online for more information.